『화엄경』의 7처9회(七處九會)의 설법내용을 그린 변상도로, 비단 바탕에 채색하여 그린 그림이다. 이 화엄탱은 기본구성을 잘 보여주는 작품으로 구도상 상·하단 모두 법회장면이 거의 대칭을 이루며 펼쳐지고 있음을 알 수 있다. 아랫부분에는 제1회 ‘보리도량회’를 중심으로 왼쪽에는 보광명전에서 열린 제7회·제2회·제8회가 자리하였으며, 오른쪽에는 제9회 ‘서다림회’가 위치해 있다. 그리고 윗부분에는 아래로부터 위로 진행되면서 오른쪽에 제3회 ‘도리천궁회’와 제4회 ‘야마천궁회’를, 왼쪽에 제5회 ‘도솔천궁회’와 제6회 ‘타화자재천궁회’를 배치시켜 대칭구조를 이루고 있다. 계획적이고 짜임새있는 구도와 더불어 황토색 바탕에 홍색과 녹색 및 금색을 사용하고, 각 회주인 보살형 노사나불의 영락에 고분법을 활용하여 장식함으로써 화면이 밝고 화려해지는 18세기 불화의 경향을 살필 수 있다. 한편 그림 아랫부분에는 보현보살이 대중들에게 비로자나불의 정토인 연화장세계의 모습을 설명하고 있는 『화엄경』39품 중의「화장세계품」내용을 도해한 ‘연화장세계도’가 그려져 있어 주목된다. 그림에 대한 내력을 적어 놓은 기록에 의하면, 조선 영조 46년(1770)에 화련을 비롯한 12명의 승려화가들이 무등산 안심사에서 조성하여 송광사로 옮겨졌음을 알 수 있다. 이 불화는 현존하는 조선시대 화엄경변상도 중 조성시기가 가장 빠름은 물론, 『화엄경』의 7처9회 설법내용을 매우 충실하게 효과적으로 그려내고 있는 기준작이라는데 사료적 가치가 있다. 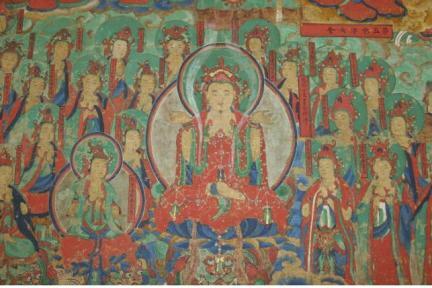 The colored painting is about the Seven Locations and Nine Assemblies stated in Avatamsaka Sutra (The Flower Garland Sutra) made on silk fabric. Overall, it is well-balanced symmetrically with a well-set composition. It uses red, green, and gold colors on mud-yellow ground, showing a trend toward the use of brighter, more gorgeous colors in the Buddhist paintings of the 18th century. 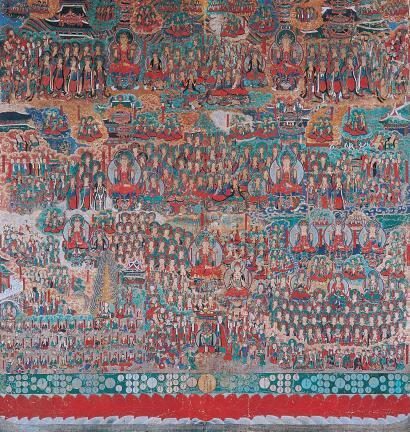 The lower part of the painting contains the image of Samantabhadra explaining the world of the universal lotus flower, which is Vairocana Buddha’s pure land to ordinary people. According to records, a group of 12 monk painters, including Hwaryeon, made this painting in 1770 (46th year of the reign of King Yeongjo of Joseon) at Ansimsa Temple in Mudeungsan Mountain but was later relocated to its current location. 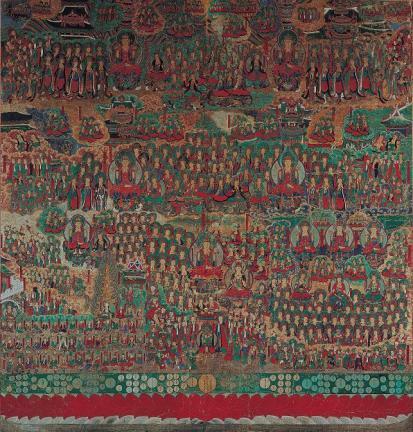 A valuable object, it is the earliest existing one among the illustrations of Avatamsaka Sutra, faithfully depicting the Seven Locations and Nine Assemblies stated in Avatamsaka Sutra.